VATSIM, or Virtual Air Traffic Simulation Network, is a non-profit organization operating a dedicated, worldwide, Internet-based flight-simulation network. Users can connect to the network to either fly online as a pilot using flight simulation software such as Microsoft Flight Simulator X, Prepar3D or X-Plane, or direct traffic as an air traffic controller (ATC) and participate in what has been described as a close approximation of real-life aviation procedures. The organization has achieved notability for its very high level of participation and realism, that has seen it in use as part of Federal Aviation Administration funded research projects. This notability resulted in the organization being featured on the front page of The Wall Street Journal in 2006. It is considered the largest online flight simulation network in the world with over 400,000 registered members as of March 9, 2019, with hundreds of participants online at any one time. 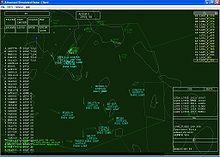 Virtual radar client (VRC) is software used by some controllers on VATSIM. VATSIM is one of the two main providers of flight-simulation networks that allows users to either fly online as a pilot, or direct traffic as an air traffic controller (ATC). Communications between pilots and controllers are carried out using integrated voice-over-IP or in-game text messages. Users require custom software to use the network. Through VATSIM, ordinary people have come together as a network of pilots interacting with air traffic controllers to produce a vast, organic simulation of actual air traffic. The goal is to keep the simulation as close as possible to real-life aviation procedures, including realistic procedural standards and radio phraseology. This has made VATSIM a training aid to student pilots who lack experience at communication with air traffic control, as well as private and commercial pilots looking to enhance their skills, especially in radio communications. In achieving this the network has been highlighted as bringing more immersion to what was once a solitary exercise, events in the game are no longer just programmed into the software but are introduced by the combination of human effort and error. Networks such as VATSIM have been described as offering very strict experiences, and may achieve very high levels of standards for training and currency even for those already involved in real world flying. The network has been highlighted as being a key component in the development of flight simulation as commodity software. Much like its real-world counterparts, VATSIM is divided into separate geographic areas each with slightly different operating procedures to handle the various local differences. VATSIM is divided into six regions which are further subdivided into country-specific divisions. The divisions themselves are divided into Flight Information Regions (FIRs), Virtual Area Control Centers (vACCs) and Air Route Traffic Control Centers (ARTCCs). The VATSIM organization was founded as a result of the dissolution of the Simulated Air Traffic Controllers Organization (SATCO) in July 2001. In the mid 1990s, the evolution of the Internet and modern flight simulators allowed users to fly together using multiplayer functions of the simulators. In 1997, the first version of SquawkBox was created by Jason Grooms with later versions developed by Joe Jurecka as an add-on for Microsoft's Flight Simulator 95, enhancing the built-in multiplayer features to allow large numbers of players to connect to the game. ProController, a radar simulation program also developed by Jason Grooms, was created in the same year and allowed pilots and controllers to be connected. A third component, the FSD Server, was created by Marty Bochane which provided the signaling infrastructure and logic required to tie ProController and Squawkbox together in a logical fashion. The creation of these three programs allowed large-scale multiplayer to occur, whereas previously only one controller could control a single player. The system also allowed, for the first time, a user to fly around in real-world weather conditions which changed as they flew. Former staff members from SATCO commenced the creation of a new organization, almost immediately spearheaded by former Deputy Director Harvey Stein. 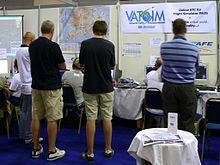 The organization was formally announced as VATSIM on July 12, 2001, with the grand opening to occur later in that month. Stein was then elected as the President of the Board. The VATSIM Board of Governors had drawn up terms of agreement with Randy Whistler from SATCO that saw VATSIM become the official successor of SATCO. In 2018, VATSIM confirmed that it had hit 80,000 active members for the first time. The network has attracted significant attention in the media, including a Wall Street Journal article and coverage in newspapers, radio, and magazines around the world. Much of this coverage is in mainstream media, not limited computer gaming or information technology media outlets. Coverage has been overwhelmingly positive, although often emphasizing the peculiar nature of those enjoying such a complex hobby that to many closely approximates work and can cost thousands of dollars. Commentators have described the network as giving flight simulators an interest and depth that they would not otherwise have. The network's greatest asset as been described as the positive attitude and friendliness of its members. It has also been praised for its realism and the quality of its software. It is considered the largest online flight simulation network in the world. Air & Space magazine described the network as being an active, extremely realistic approximation of real flight conditions, praising the quality of both pilots and controllers in promoting a realistic experience. The experience has been described as very strict, going further than some participants might like or enjoy. VATSIM is supported by what has been described as remarkably complex and robust software to allow the operation of the network. This software has allowed the online flying experience to become increasingly realistic with software that closely resembles the screens used in the real world for managing aircraft. Users need custom plugins (such as SquawkBox, FSInn, vPilot or XSquawkBox) for flight simulators (such as Microsoft Flight Simulator, Prepar3D or X-Plane) to connect as pilots, or radar simulation applications Advanced Simulated Radar Client (ASRC), Virtual Radar Client (VRC), EuroScope, vSTARS, or vERAM to connect as air traffic controllers. VATSIM-specific applications are available for free and provided by the network itself. Network service is provided by proprietary servers located throughout the world. All servers are interconnected so that users can see each other on the network, no matter which particular server they connect to. There are also additional third party tools available that are not essential for the usage of the network, but can provide useful information such as aggregated statistics for airports, route information, and flight history. The network has more than 400,000 registered members, with more than 80,000 of these classed as currently active, in May 2018. Users must join the organization as members before they can connect to the network, but membership is free. Members must be at least 13 years old. There are no usage fees for connection to the VATSIM network. It is common for younger members interested in getting into real world flying to use the network to develop their skills, particularly the often daunting task of communicating with other pilots and Air Traffic Control. The network provides the opportunity for those new to aviation to develop their skills through a series of training programs modeled on what is required in the real world. The VATSIM network does not require virtual pilots to take any training before flying, however virtual air traffic controllers are required to undertake mandatory training before opening a controlling position. Every person will be assigned the 'OBS' rating upon signing up to the network. They will then be trained through a series of ratings. S1 (Can control various aerodrome positions up to and including tower, subject to local restrictions), S2 (Can control tower positions), S3 (Can control radar positions) and eventually C1 (Can control area positions). The rating of C3 an be awarded to members who have contributed to their division in a substantial way. This is different for each division. In 2005 the Israeli airline El Al required more than 700 of its new pilots to go through a personal computer simulation that was hosted by the members of VATSIM to provide realistic training for their pilots. P6, P7, P8 and P9 are all currently in development. These ratings can be achieved by visiting an ATO (Authorised Training Organisation). A list of these can be found on the List of VATSIM approved ATOs. VATSIM is governed by a self-appointing board of governors and an executive committee. Administration and day-to-day operations are supported by volunteers, donations, and sponsorship. Network supervisors are also appointed to handle day-to-day issues that may arise and offer assistance. Use of the network is free. During the Operation Opensky event in 2002, total online members reached 798 concurrent connections. 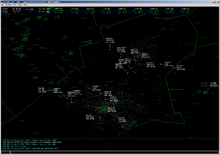 The "dots" in the screenshot represent aircraft with their routes shown as lines. The VATSIM network is open 24 hours a day and network downtime is extremely rare; pilots and controllers are free to connect and fly or control anywhere in the world at any time (subject to qualification restrictions in the case of controllers). However, the network and different ATC centers sponsor regular events to encourage pilots and ATC to congregate at various locations in the world, usually several times a week. At the most popular of these events, traffic levels may be comparable to those of the same locations in real life. Worldflight Australia is a virtual round-the-world flight to raise money for the Australian Royal Flying Doctor Service, for which VATSIM has provided virtual air traffic control over the years it has been running. In 2006, fifteen virtual flying enthusiasts used a full-sized simulator of a Boeing 747-400 in Australia to conduct a 130-hour round-the-world trip, for which Qantas Airways provided the food and VATSIM provided air traffic control. The event for 2008 raised over $30,000 USD, with over 200 pilots participating in the event in addition to the crews of the seven full cockpit simulators that were the focus for the fund raising event. The home built simulator cockpits were extensive, some costing between $10,000 and $300,000 AUD to make and taking years to complete. Cross the Pond is a biannual event on VATSIM, taking place once every Spring and Autumn. During Cross the Pond, pilots fly between Europe and Northern America, crossing the Atlantic (the pond). Air traffic Controllers provide en route-service through the event, which usually lasts more than 12 hours. Prior to the event, several weeks in advance, five European, and five Northern American airports are chosen to be the focus airports of the event. Each airport on one continent is connected with several routes to each of the five airports on the other continent. On October 14, 2017 during the Eastbound Cross the Pond event VATSIM surpassed a record of the most pilots connected to the network having more than 1,458 people online. ^ Radcliffe, Doug; Andy Mahood (2003). Microsoft Flight Simulator 2004: A Century of Flight (Official Strategy Guide). John Wiley & Sons. p. 188. ISBN 0-7821-4237-0. ^ a b c d e Sanders, Peter (May 18, 2006). "In Imaginary Skies, Would-Be Controllers Guide Pretend Pilots". Wall Street Journal. Retrieved April 29, 2008. ^ a b Castronova, Edward (2005). Synthetic Worlds: The Business and Culture of Online Games. University of Chicago Press. p. 158. ISBN 0-226-09626-2. ^ a b c Wallace, Lane (October 1, 2006). "Microsoft Unveils Mission-Capable Flight Sim X". Flying. p. 45. Retrieved April 15, 2009. Systems like VATSIM are apparently very strict experiences, however, with standards for training and currency that can be more intense and involved than some pilots want to undertake. ^ a b Stewart, Laverne (December 5, 2009). "Flight Simulation". The Daily Gleaner. Retrieved March 24, 2011. ^ a b c d Rheinberger, Joel (November 28, 2008). "Flight simulator takes off in Lauderdale". 936 ABC Hobart. Retrieved March 24, 2011. ^ D’Alessandro, Nic (November 15, 2007). "Transference of PC based simulation to aviation training: issues in learning" (PDF). InSite Solutions (Tas.) Pty Ltd. Retrieved April 29, 2008. ^ Maharg, Paul (2007). Transforming Legal Education. Ashgate Publishing. p. 165. ISBN 0-7546-4970-9. ^ a b c Regis, Ed (January 1, 2009). "Welcome to Cyberairspace". Air & Space Magazine. Retrieved March 28, 2011. ^ Takeda, K.; Newman, S.J. ; Kenny, J.; Zyskowski, M (2008). "Convergence: commodity flight simulation and the future". Aeronautical Journal. California: University of California. 112 (1136). Retrieved May 7, 2009. ^ Galvin, John (March 2003). "Always a Dull Moment". Wired. Retrieved April 14, 2008. ^ a b "Gaming News". PC Gamer. GP Publications. 15 (4–13). 2008. Retrieved March 28, 2011. ^ a b c Galvin, Nick (June 6, 2006). "Cockpit capers". Sydney Morning Herald. Retrieved January 14, 2009. ^ Maharg, Paul (2007). Transforming legal education: learning and teaching the law in the early twenty-first century. Ashgate Publishing, Ltd. p. 346. ISBN 0-7546-4970-9. ^ a b Kimbrough, Steven O.; D. J. Wu (2004). Formal Modelling In Electronic Commerce. Birkhäuser. p. 17. ISBN 3-540-21431-3. There now exists a vibrant community organized around VATSIM, as well as remarkably complex and robust software supporting these activities. ^ Barter, Pavel (July 13, 2008). "Flights of Fancy". CVG. Retrieved July 14, 2008. ...three air traffic control programs which are amazingly close to the screens used in the real world. ^ "Members | VATSIM.net". www.vatsim.net. Retrieved October 8, 2017. ^ "The International Online Flying Network: Air Traffic Control". VATSIM. Retrieved July 18, 2013. ^ "Worldflight Australia". Worldflight Australia Website. Retrieved January 14, 2009. ^ "WorldFlight 2008 raises over $30,000" (Press release). VATSIM. January 12, 2009. Archived from the original on December 17, 2008. Retrieved January 14, 2009. Official website – Includes links to region- and division-specific web sites. vataware – Detailed statistics & live flight tracking for VATSIM traffic. Worldflight Group – Worldflight Group official website.